Don’t believe me? 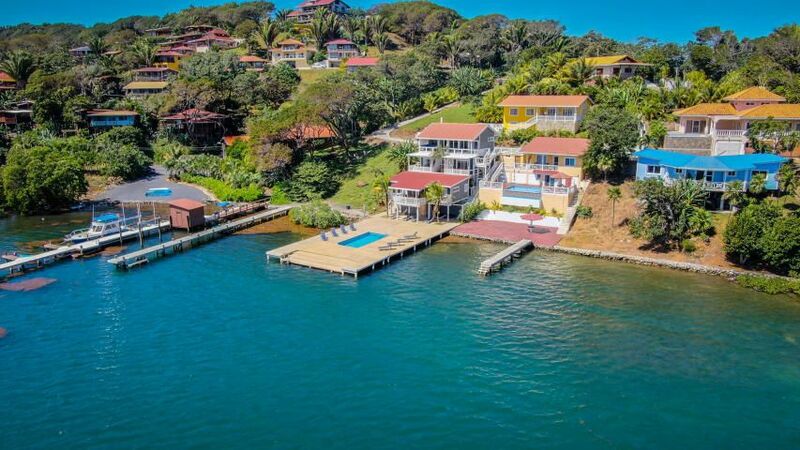 Just check out this article in the New York Times highlighting the value of a sprawling compound for sale here in Sandy Bay. And that’s definitely not the only deal on the island! 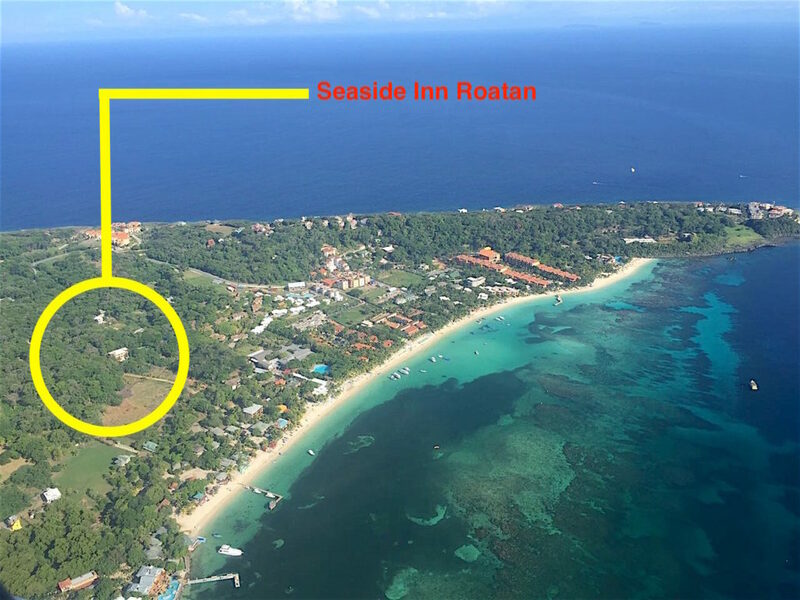 Roatan is primed for buyers to get the best deal for Caribbean island real estate. Those units that were selling for $1M before the housing crash are now available at half the price. We’re seeing luxury homes in focus this year, with recovery in the US and Canada encouraging residents to seek a second-home investment. 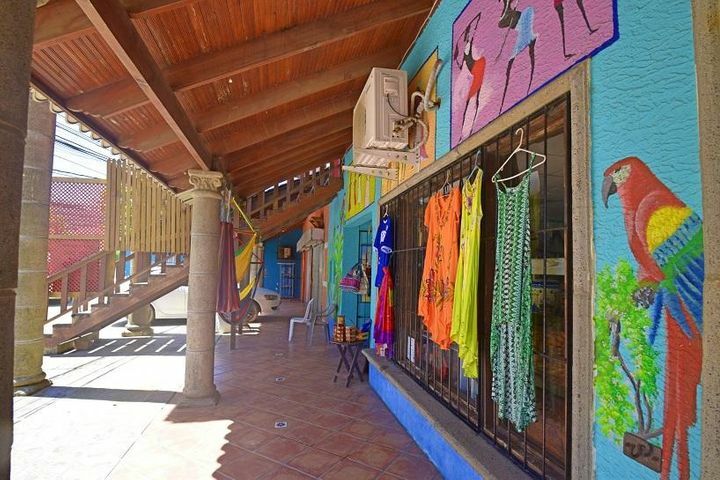 The rental market is popular in Roatan. 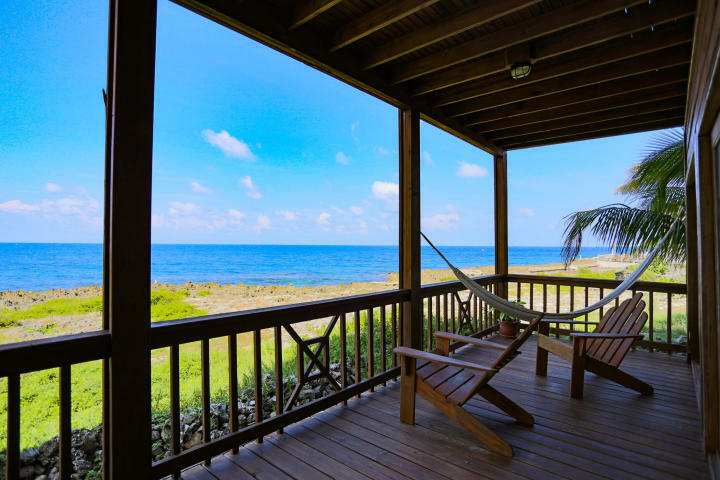 This offers second-home investors the option to spend a few weeks on vacation here in Roatan and then earn an income renting the home to others the rest of the year. It’s a win-win when you’re ready to expand your investment portfolio. 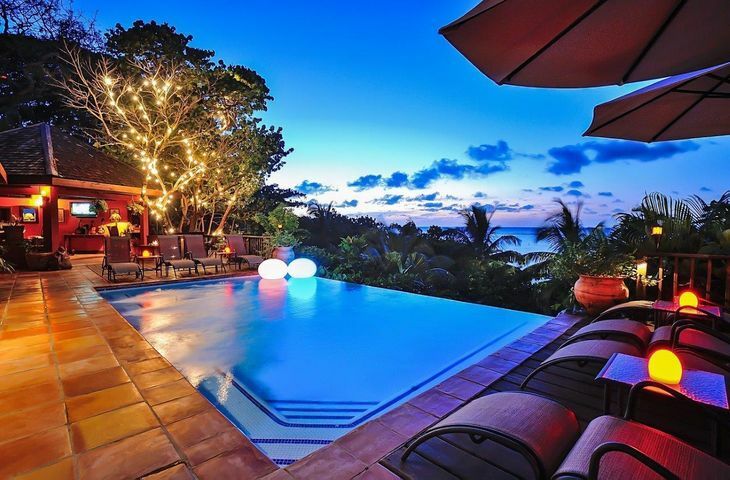 I am a Resort and Second Home Property Specialist as well as an International Real Estate Specialist, so I know a thing or two about making the right investment here on the island. Feel free to ask me more about the current buyers market situation. 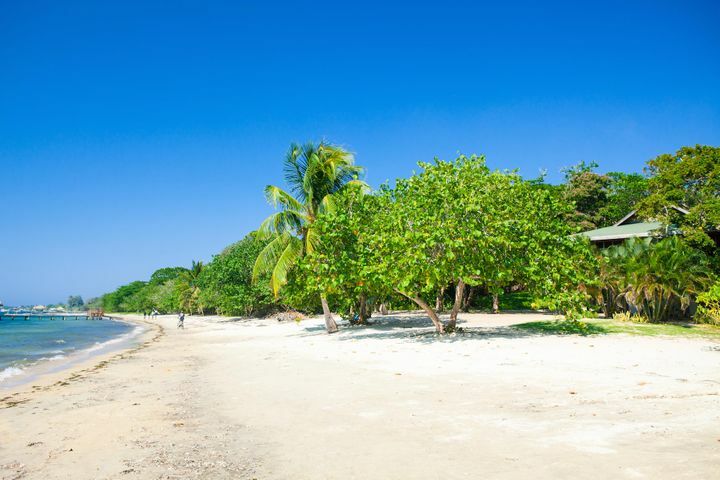 Roatan is a Caribbean island without the high price tag you see on other Caribbean islands today. With lower-priced homes available, you can find the right investment opportunity here at a wide range of price points. If you’re ready to invest in a second home or if you’re looking ahead at retirement overseas, the buyer’s market in Roatan is ready for you. This is the best time to grab the right deal as prices continue to slowly climb in the years since the recession. As that NYT article shows, we have jaw-dropping luxury homes at a fraction of the cost on other Caribbean islands. But that low cost doesn’t reflect low value. Roatan has its own international airport servicing direct flights to Atlanta, Miami, Houston, Montreal and more. 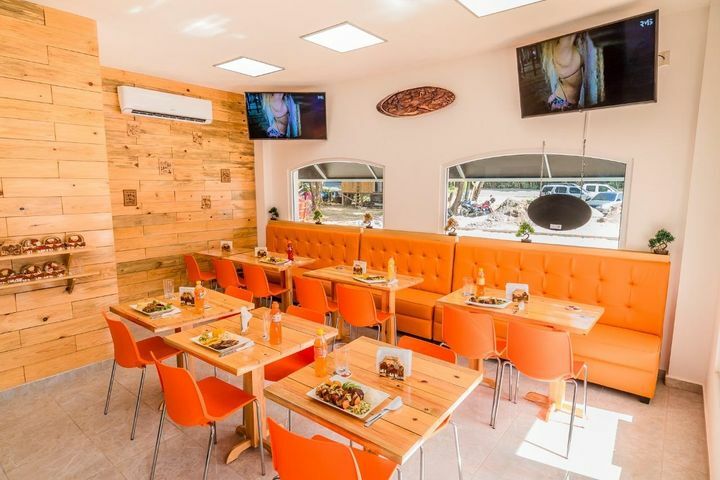 We also offer eclectic dining, with a variety that reflects the international population who have chosen this tropical paradise as the perfect home. 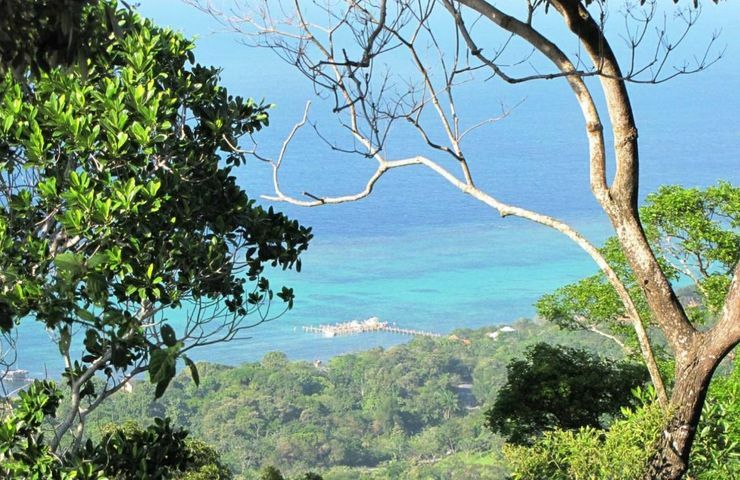 What you won’t find here in Roatan is high-rise condos blocking your sea view. You also won’t see the standard chain restaurants taking over every street on the island. On the contrary, we boast a wide variety of locally-owned businesses and mom-and-pop places to explore. From high-end fare to roadside pop-up grills, whatever you fancy can be found in Roatan with lower price tags and customized attention. A buyers market never lasts as long as you want it to…it’s an opportunity you need to take hold of before it disappears. If you’ve been considering investing but haven’t yet taken the next steps, now is the time. You can, of course, wait and continue to research and hesitate – that’s your prerogative! But a buyers market for island real estate is not the norm. If you’ve been planning and hoping, get in touch now and let me show you what your best bets could be in Roatan. You might be surprised to see some extraordinary deals that you thought would be out of your reach. But you won’t know if you never take that next step. Feel free to reach out for some customized ideas based on your plans…I’m always happy to help! Are you considering investing in Caribbean island real estate? 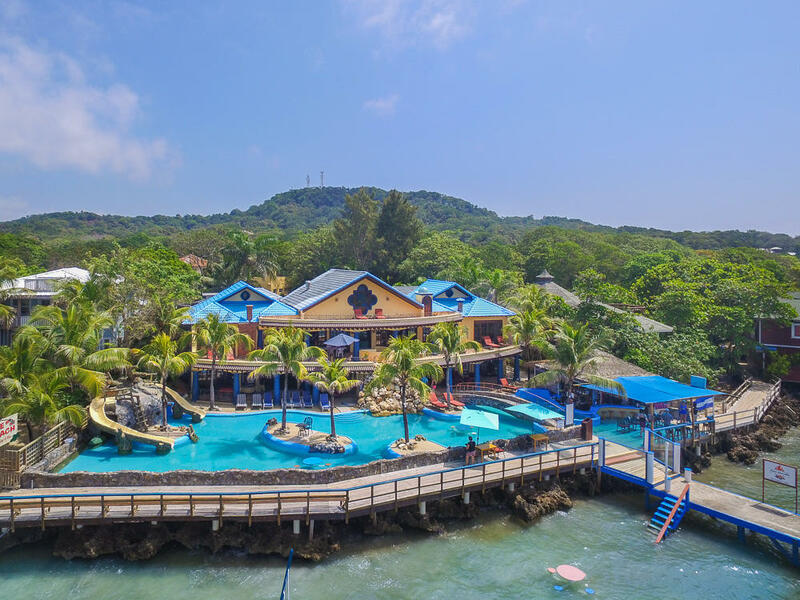 The Caribbean island of Roatan offers the best of everything: Affordable real estate, direct flights to the U.S. and Canada, tropical vibes, and a laidback lifestyle. 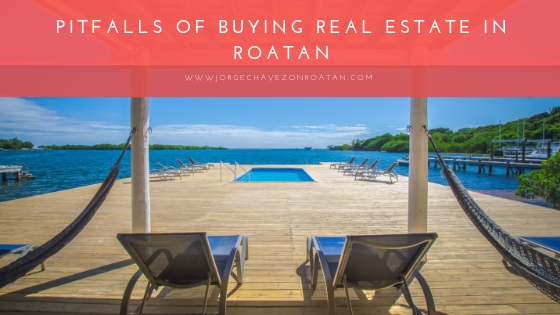 Roatan island real estate options vary from condos to island-style homes to sprawling villas…so you can take your pick! 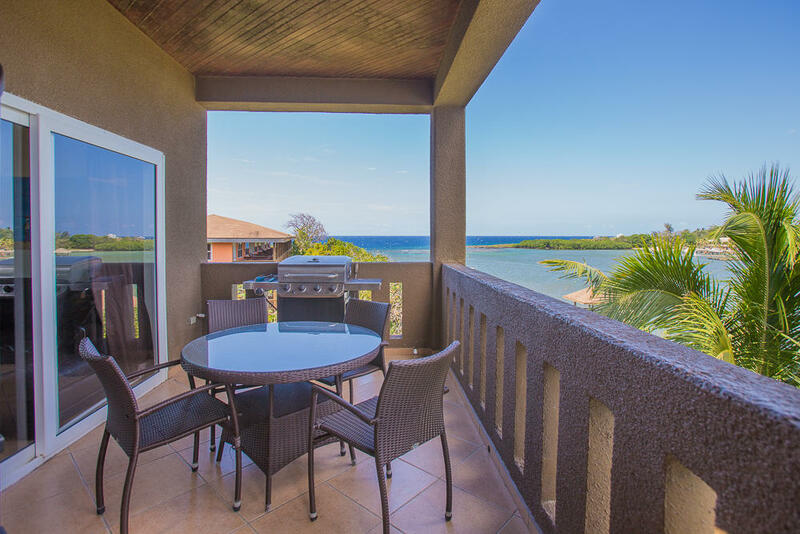 Real estate in Roatan can be the ideal option for your retirement or as a second home investment, with a strong vacation rental market making it easy to rent out your home whenever you’re not using it yourself. Many of the options listed below would include great potential as a rental opportunity, so have a look if that’s what you are aiming to do. 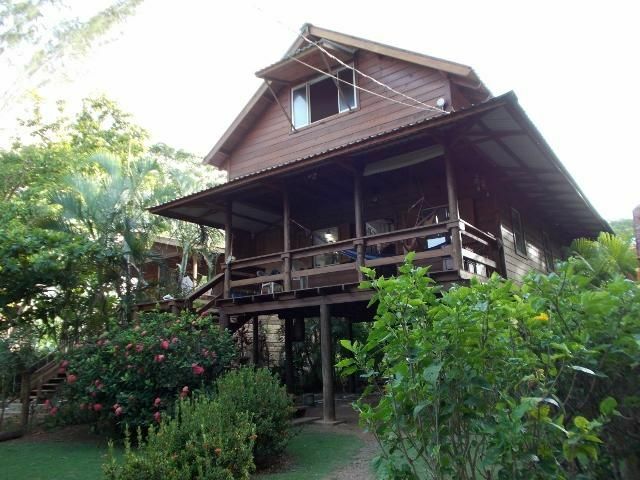 Caribbean island real estate in Roatan comes in all shapes and sizes, with a variety of price points as well. Whatever your budget and needs, you’re guaranteed to find something perfect for you here on the island. Just don’t wait too long…prices continue to go up and an island only provides limited space for future construction! 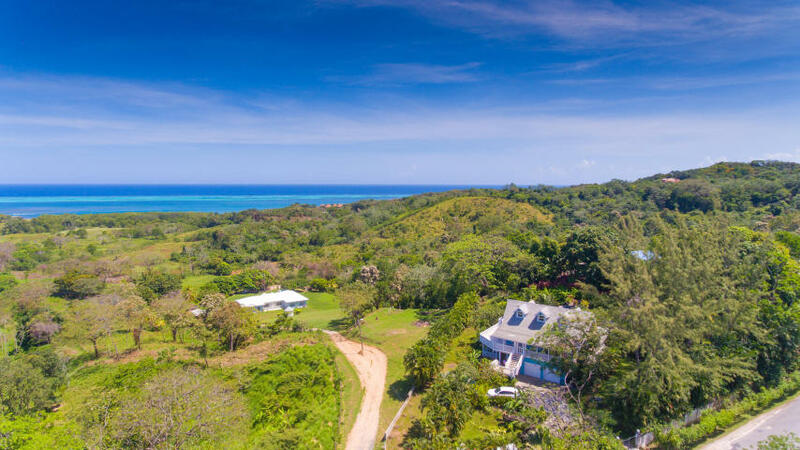 Here are several Roatan real estate options on the market right now to make your Caribbean island dreams come true. Listed at $150,000 with 570 square feet in the heart of West End. Cocolobo is situated in the very popular area of West End, with walking access to bars, restaurants, dive shops, and more. 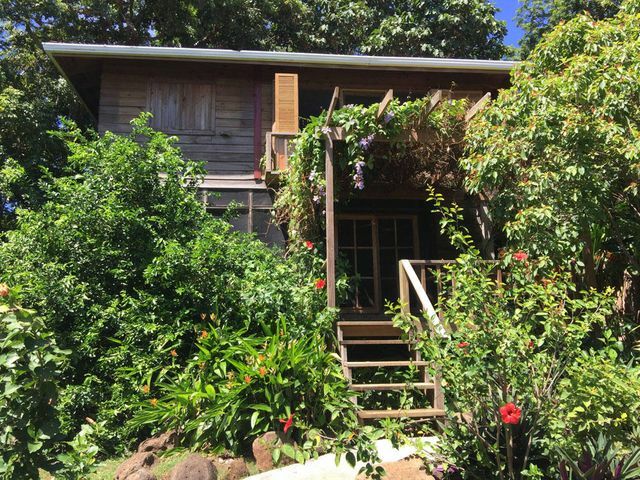 This beautifully remodeled studio efficiency provides two double beds overlooking the ocean along the iron shore. The top floor units are larger, with pitched ceilings, and large balconies with floor-to-ceiling glass sliding doors offering endless ocean views! A new kitchenette, new furniture and fixtures, and new air conditioner and ceiling fan were included in this year’s remodel. All owners and tenants have access to the Cocolobo amenities, including a lounge, full size kitchen, sun deck, BBQ, bar, and infinity plunge pool overlooking the ocean. 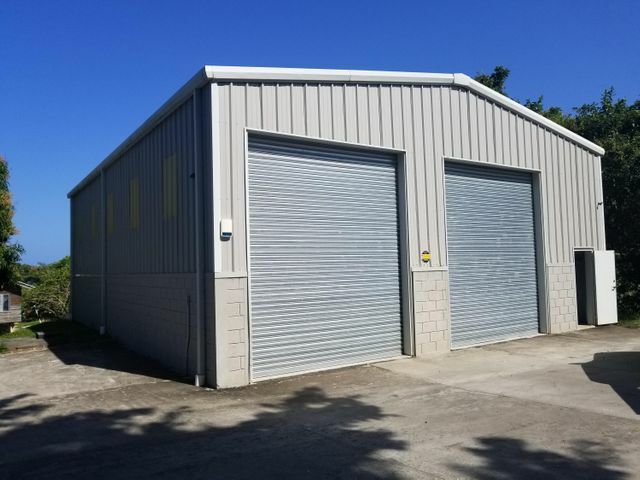 This offers incredible rental potential! Listed at $325,000 with 2,374 square feet, this is Phase I of development. The exclusive West Bay Golf Club & Villas development will offer the experience that West Bay has been waiting for: A 9-hole, par 3 golf course! Phase I is now under construction, with a Perry Dye-designed course anchored by 22 villas, 14 single family homes, a restaurant, club house and a bar/swimming pool. The development will be professionally managed and you can opt into the rental program for a source of revenue. This offers incredible long-term potential for a rental market that is sure to be successful. Listed at $395,000 with 8,445 square feet on 0.48 acres. 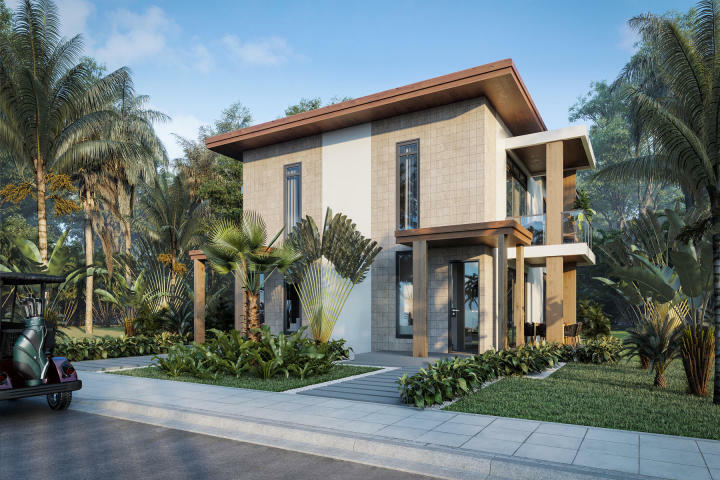 Masterful design and comfort make this 4 bedroom/3 bathroom island-style home a tropical oasis. 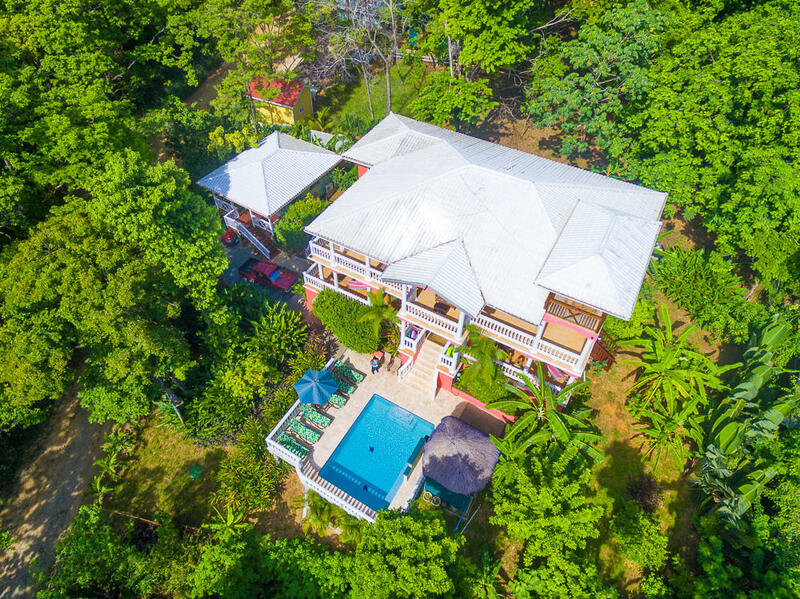 Conveniently located just a short drive from all the amenities of French Harbour, this home offers an escape from it all without disappearing into the jungle. Enjoy the tropical island landscaping and soaring ocean views from the extensive windows and large deck with multiple seating areas. 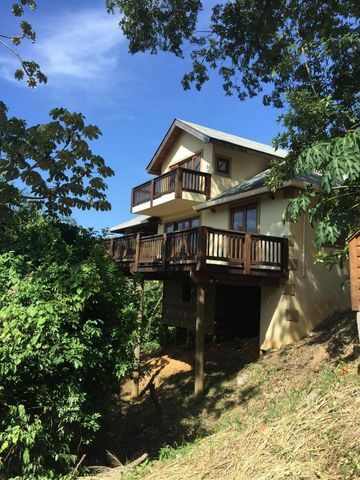 Below the home is a one bedroom apartment that can be accessed both from the inside for additional sleeping quarters or locked off and accessed only from the exterior, offering a perfect rental potential. This type of home offers the best of both worlds: retire here while still getting a rental income from the separate downstairs unit! Listed at $399,000 with 1,582 square feet on 0.33 acres. 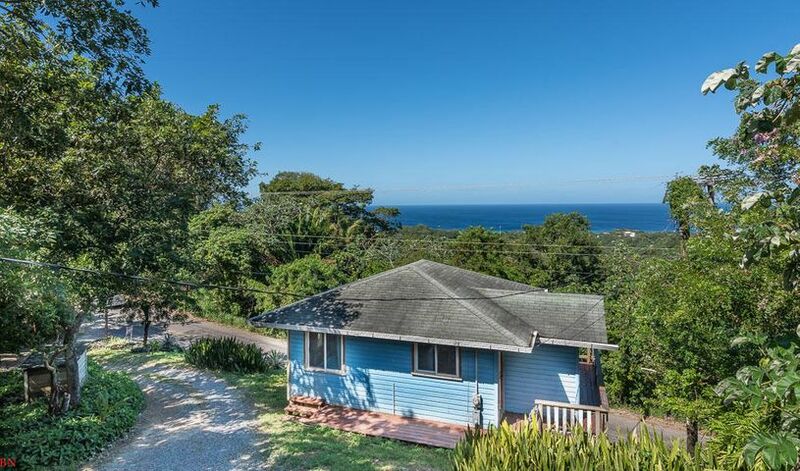 This unique home rests on one of the highest hills in the quiet Sandy Bay area, providing magnificent panoramic ocean and mountain views. 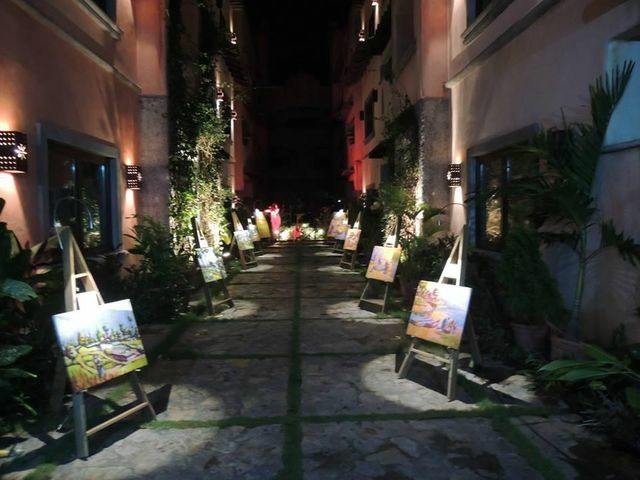 Surrounded by tropical gardens and flowing trade winds, this is a must-see! 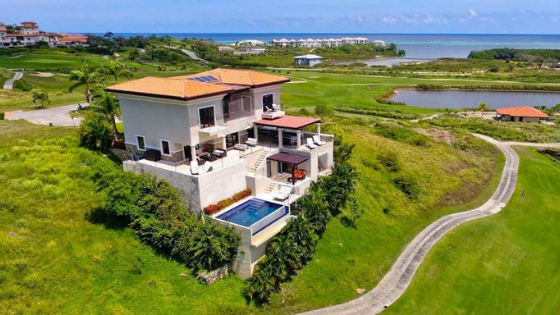 The home offers a spacious open-concept living area overlooking the stunning patio and pool area…all with Caribbean vistas sprawling out before you. This is truly the good life in the islands. You won’t ever want to leave! 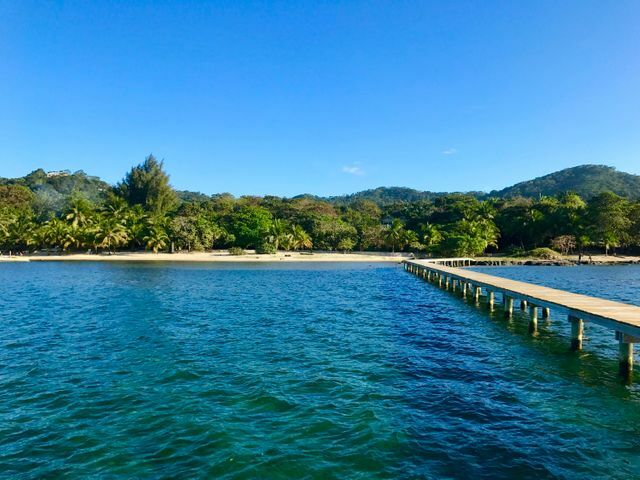 Whether you saw something you loved or you’re still looking for your perfect place to call home, contact me and let’s chat about your options for Caribbean island real estate in Roatan. The market will only keep getting stronger, so there’s no better time than the present! 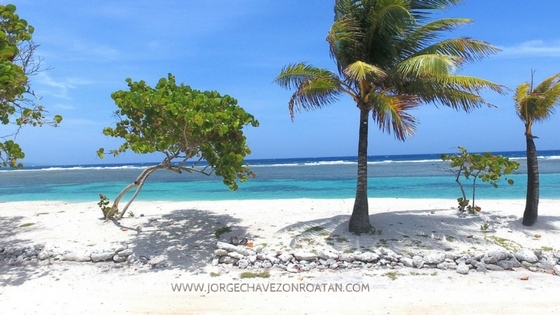 I am in the business of selling real estate on the Caribbean island of Roatan, located just off the coast of Honduras. But I’m not just here to sell a property and then walk away. 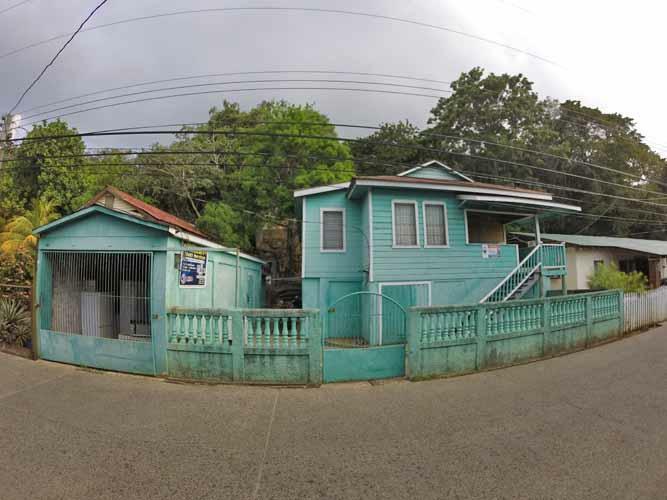 There are too many realities of island life that I think some folks overlook when jumping into the real estate market, so I choose to be available as more than just a real estate agent. After all, I did the same move years ago, so I know what it’s like! 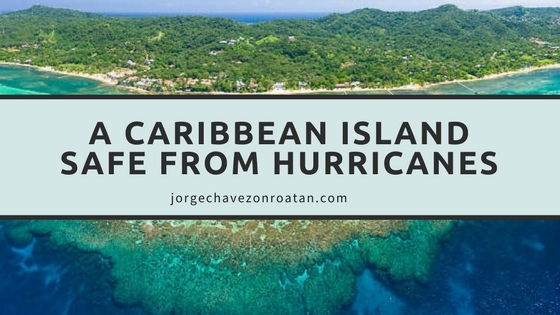 I left my life and home in the U.S. to move to Roatan with my young family. We wanted to raise our son in a slowed-down environment, where nature takes center stage for his playtime and exploration. And we absolutely made the right decision! But there are certainly limitations to living on an island. After all, an island is surrounded by water and there’s only so far you can go in any direction. 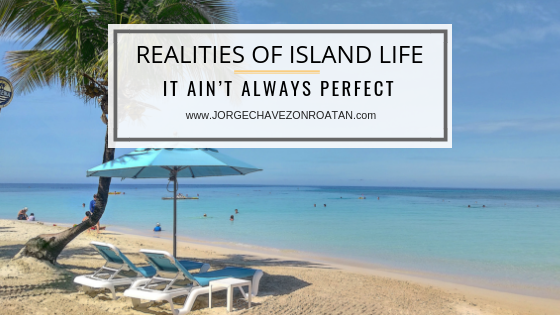 I’m always happy to chat with clients about the ups and downs of living on an island, so here are some of the basic realities of island life to consider when you are looking at moving to Roatan. 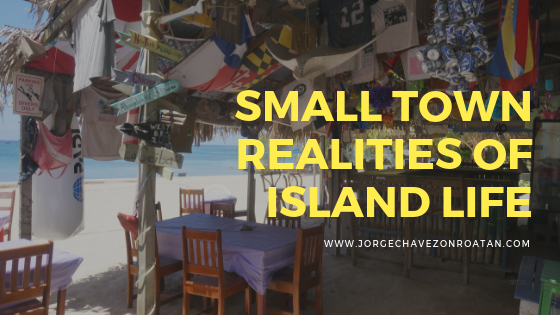 Living on an island with limitations means that our towns and our overall population are small, making island life another version of small town life and all that it entails. Small town life can be a harsh adjustment for some folks who are used to the anonymity or even the plentiful options for entertainment and nightlife when living in a city. The coconut telegraph is alive and well, so be sure to think about what you do and what you say before you end up starting a new rumor here in this small-town world! Of course, the perks of small town life are great, too. 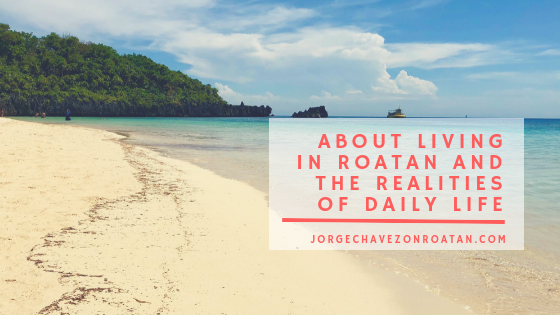 You can always check out my posts to catch a daily glimpse of life in Roatan! Island realities certainly include knowing most folks quite well, but because Roatan is also a popular tourist destination, there are constantly new people to meet and more fun to be had. 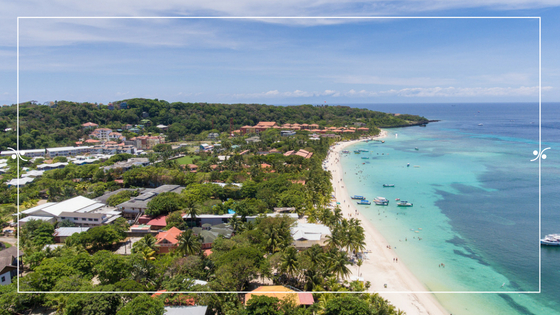 So don’t worry that you’ll feel isolated here in Roatan – the small town vibe just adds to the island life charm. When you know what you’re getting into and you understand those limitations, it’s actually a wonderful adjustment to make. Greeting all your neighbors as friends and running into friends everywhere you go is just a bonus to island living! Islands are also isolated, which also means that sometimes we don’t have options for purchases or that we have to import something specifically from the mainland. We make do with what’s available, which can be hard for some people who are used to living in the land of plenty! 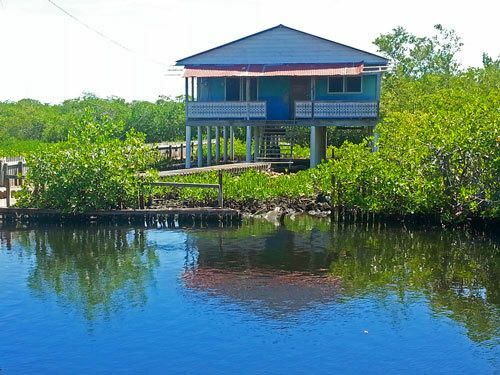 Living on an island comes with new challenges for those who have never lived on one before. You can’t take long road trips to the mountains or lakes; going anywhere requires a drive on the island’s one main winding road or hopping on a boat or a plane. You usually need to plan in advance if you want to travel to the mainland and flights can be expensive with limited options at certain times of year. 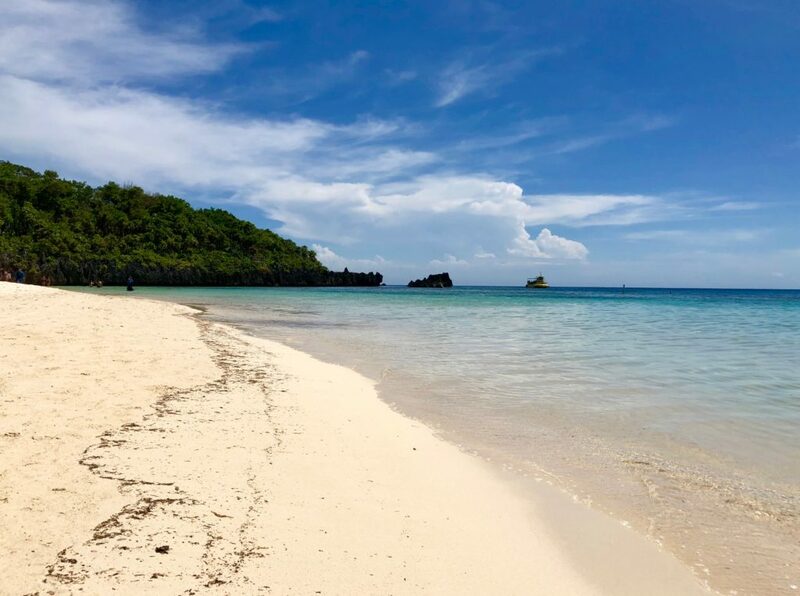 But the benefit of this island being small and our options being slightly limited sometimes is that we waste no time choosing from the hundreds of shampoos you find at a grocery store back home…we don’t spend hours in a car commuting or driving to the beach for the weekend. And living on the island of Roatan also comes with other aspects that someone from the U.S. or Canada might not understand. The legal system here can be a headache and there are certainly challenges to doing business in a developing country with often-volatile social and political problems. Luckily, our island is isolated (remember?) from many of those issues. But legal transactions for real estate and residency processing can still be a bit more of a challenge to navigate here. But just remember that red tape exists everywhere! In a foreign, developing nation, the navigating of those systems can feel like a true maze for foreigners. That’s why I can’t stress enough the importance of working with professionals. 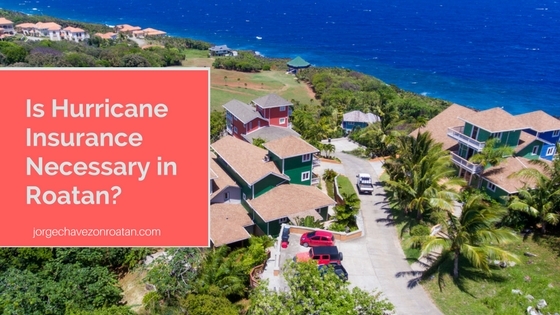 There are challenges of living on a Caribbean island that you should be aware of before you make a massive investment in real estate. Having a true professional on your side to not only help you find the right investment, but to also advise you on your potential lifestyle here or the potential pitfalls you might face as a homeowner, landlord, or retiree on this island. This is just a glimpse into the realities of living on an island in the Caribbean. Life here is wonderful, but – just like life everywhere! – there are limitations and realities you should understand before you take the leap. Nowhere is perfect. But this Caribbean island paradise sure feels mostly perfect to me and to my family. 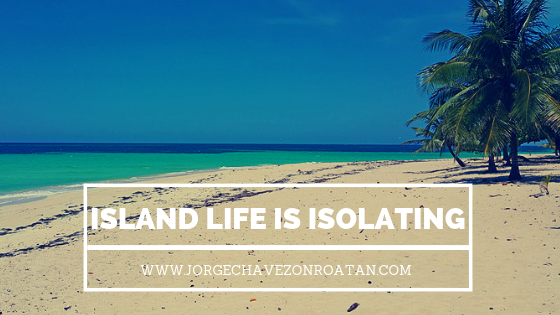 I’m always happy to talk about living in Roatan and the realities of daily life and doing business here, so get in touch and let’s talk about your potential move. I always want my clients to feel like friends…after all, we’re about to be neighbors on this tiny little rock. 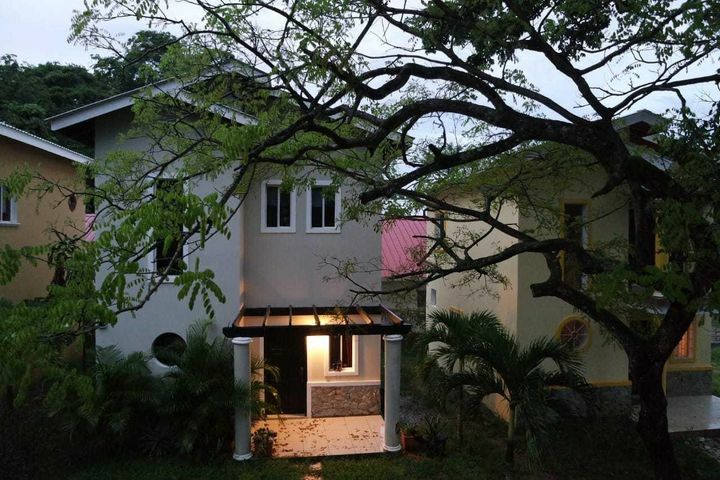 A West Bay Beach home for sale that you simply cannot miss. 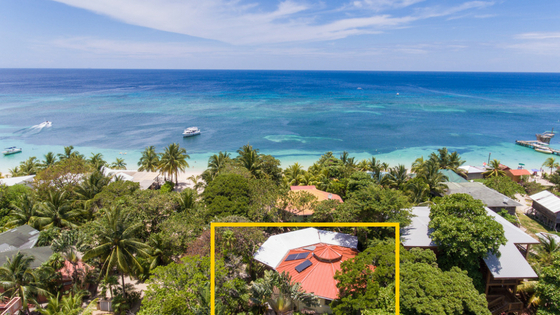 Playa Bonita is a popular vacation rental located right in the sand of West Bay…Roatan’s most popular beach! 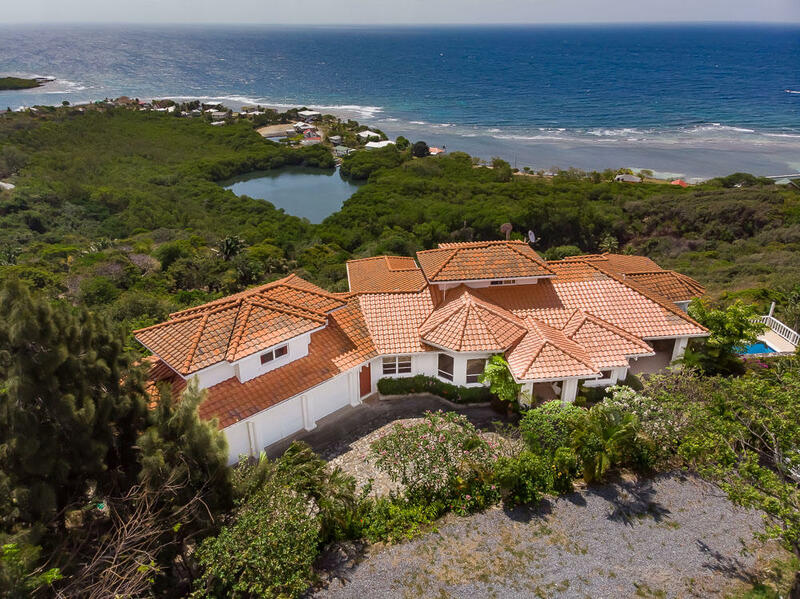 This West Bay Beach real estate is rare, so take a look and see if this is the right opportunity for you to own property in the Caribbean. Playa Bonita is a 4-bedroom duplex home right on West Bay Beach. 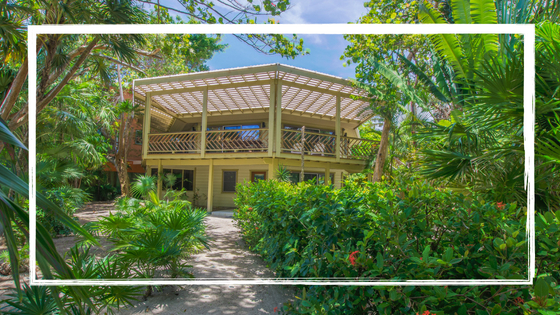 Situated in the sand and surrounded by lush tropical jungle, this home offers perfect privacy and peace without compromising convenience. If you decide to buy vacation rental property in Roatan, the downstairs unit of Playa Bonita offer two bedrooms that both come with en-suite bathrooms and are self-sufficient, so you could rent them out as separate units or as a combination. 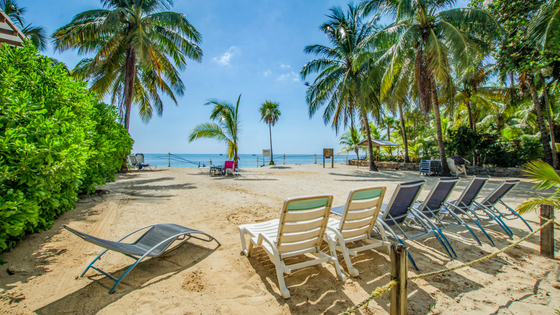 West Bay Beach is the most popular beach in Roatan. 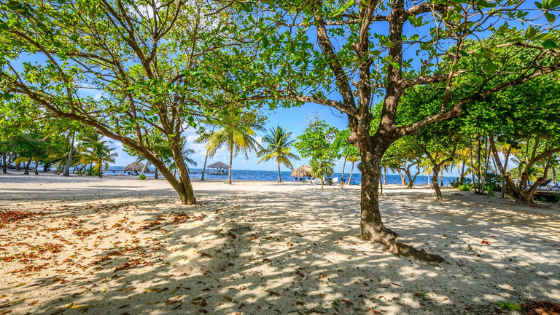 Regularly voted the best beach in Central America and one of the best beaches in the Caribbean, West Bay Beach attracts visitors and locals alike to its extensive stretch of soft white sand. 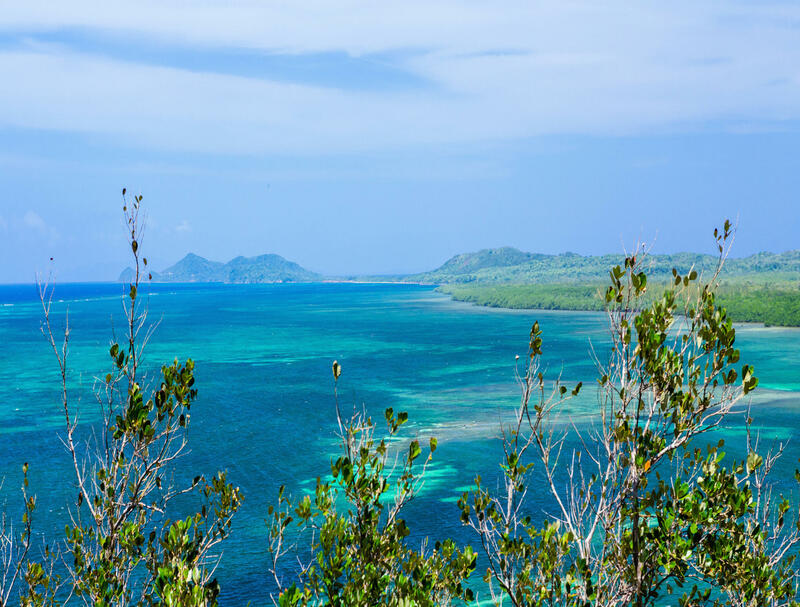 Just offshore, easily accessible on your own, is the world’s second-largest barrier reef system, with some incredible snorkeling sites within reach. Roatan is known as a scuba diver’s paradise and the amazingly easy snorkeling rivals that popularity! 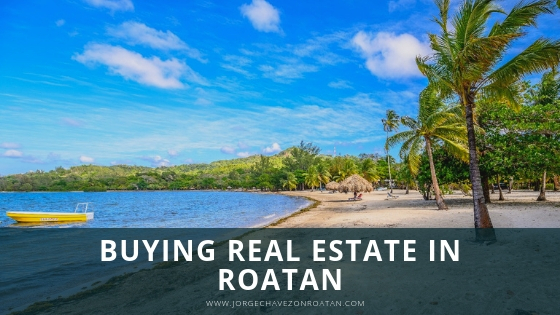 Buy a home on West Bay Beach Roatan so you can invest in the future. This island is what the Caribbean was 20 years ago. We have no major developments, but we have direct international flights and two cruise ship docks. Our popularity is just on the cusp now and is bound to keep growing! 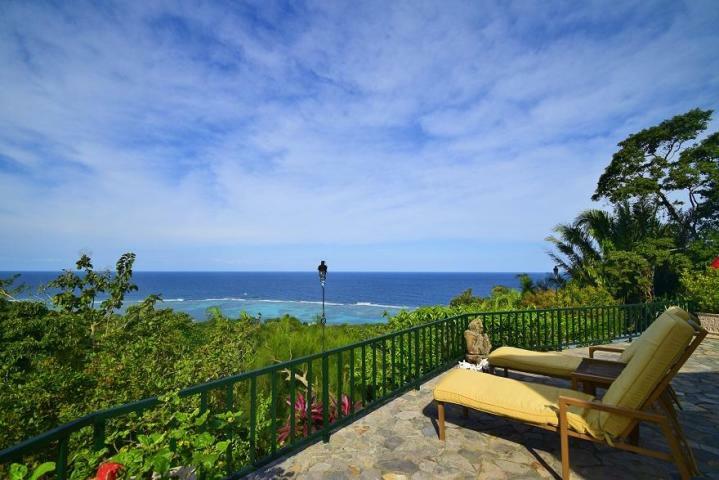 Own a home on West Bay Beach Roatan so you can get in on that popularity early. You can choose to live here yourself, invest in a vacation rental option, or even invest for a long-term plan to retire on the island. 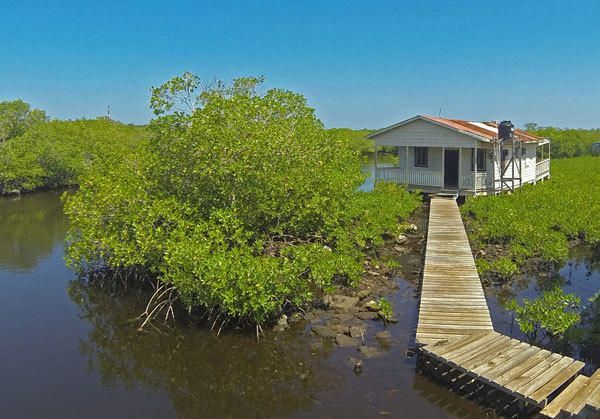 Whatever your choice, this West Bay Beach home is perfect. With the popularity of West Bay Beach, you can rest assured that the vacation rental market is steady. 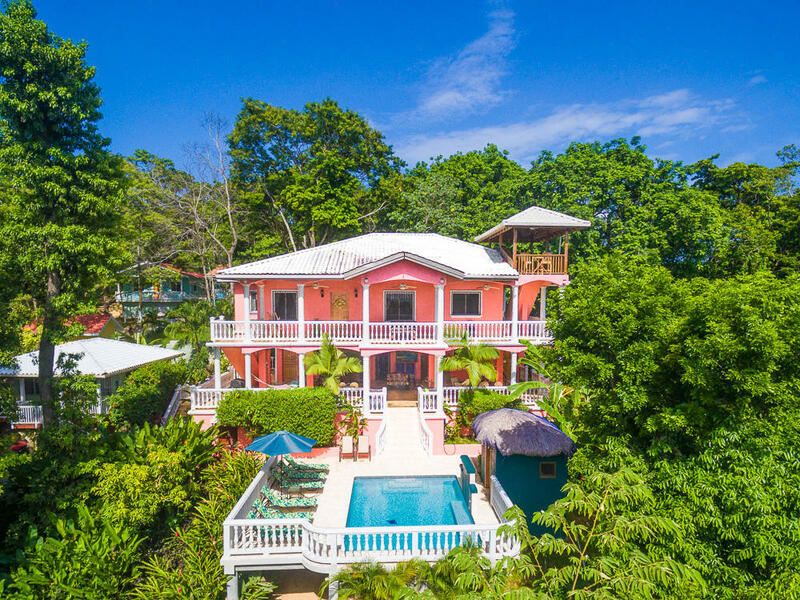 While the island still has high and low seasons, as nearly all tourist destinations do, you can enjoy the fact that West Bay Beach remains the most popular area for tourists, so a vacation rental is an easier sell even in low season. Keep in mind, however, that there is also plenty of competition right on the beach. Condos, hotels, B&Bs, and other island-style units are all readily available, so you won’t be able to charge high prices for this unit as is. You could, however, invest in a few updates and upgrades to charge more. It’s all up to you. Keep it simple and carry on with the rental options as they already are or change it up to make it your own. 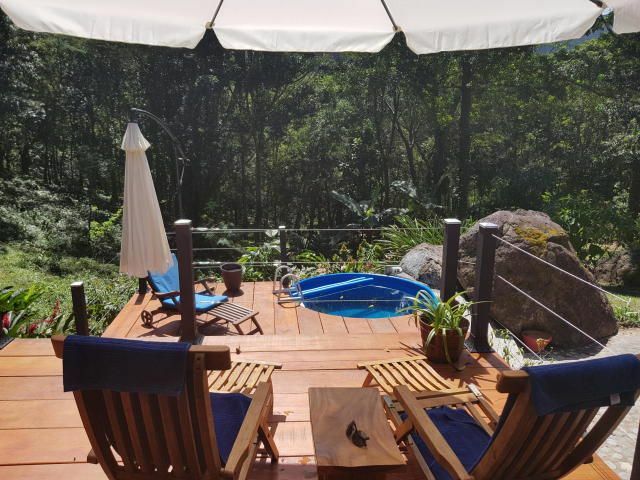 As a certified Resort and Second Home Property Specialist, I am always happy to advise you on the opportunity to purchase a second home. 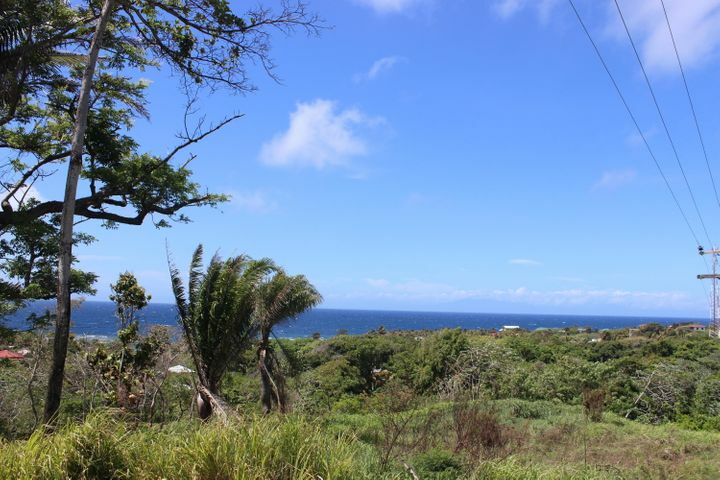 I know this island inside and out and I know what it takes to make a second home a successful investment. 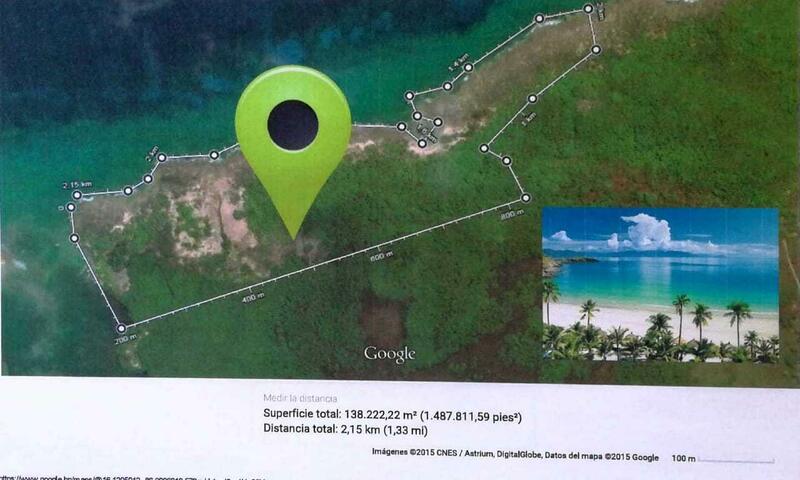 Playa Bonita has fantastic potential, so don’t miss out on this opportunity. 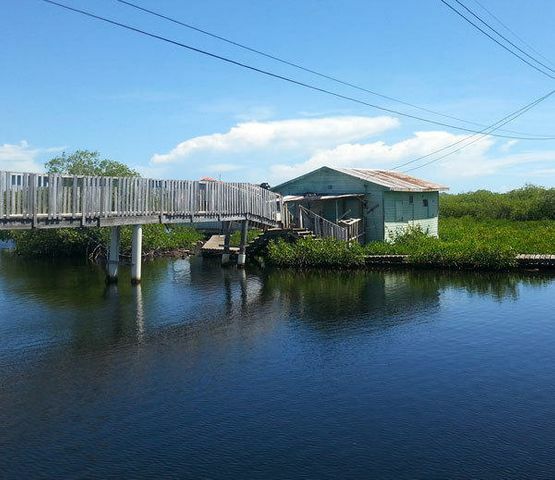 Contact me today if you’re interested in this West Bay Beach home for sale. Let me know if you’re interested and I can provide even more details. This B&B is 5-star rated and reviewed on TripAdvisor and VRBO/HomeAway. 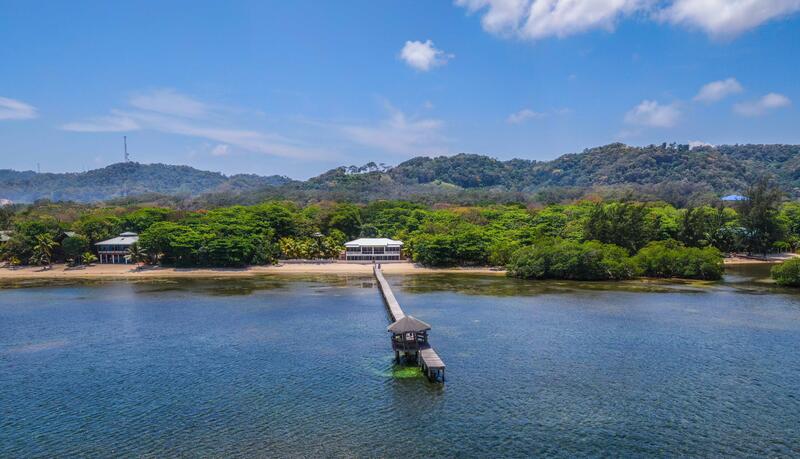 This is a unique property on the island of Roatan offering an incredible location, accommodations in pristine condition, and at a price you’ll love. High occupancy rate + return guests! If you’re looking for a new opportunity, Seaside Inn is your answer. 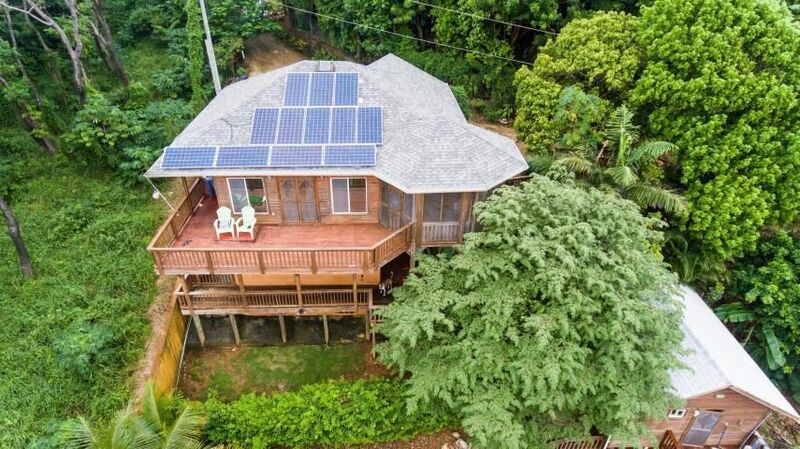 You can own a slice of paradise with a built-in revenue option. 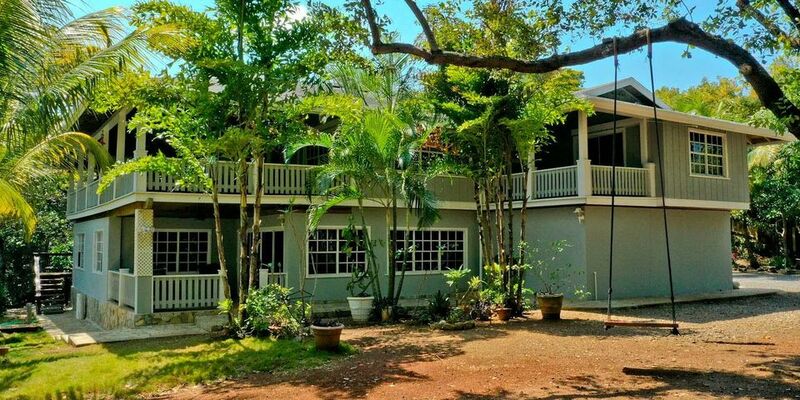 Whether this is a career change or you’re just ready to live the good life here in the tropics, this Roatan B&B provides the best of everything. 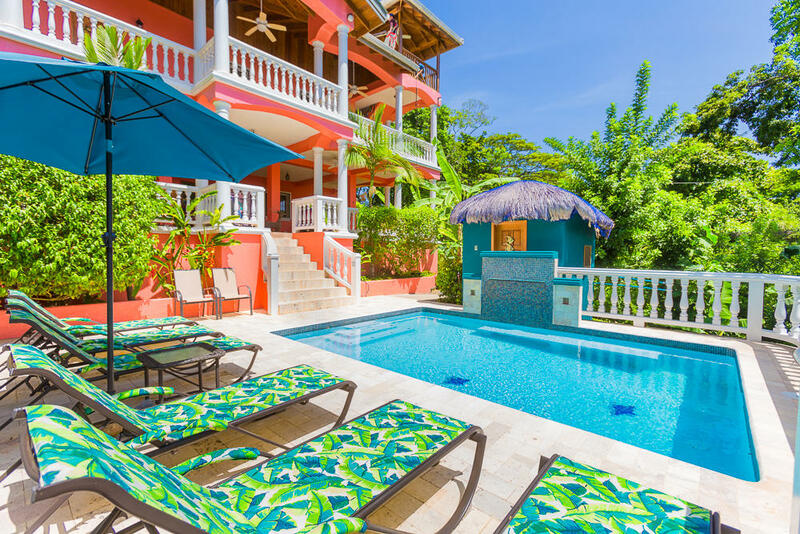 The meticulously maintained boutique resort rests just steps off West Bay Beach, one of the most popular beaches in the Caribbean. Visitors from all over the world regularly hail West Bay Beach as one of the best in the region on TripAdvisor. Roatan is also regularly hailed as a top destination in the world. 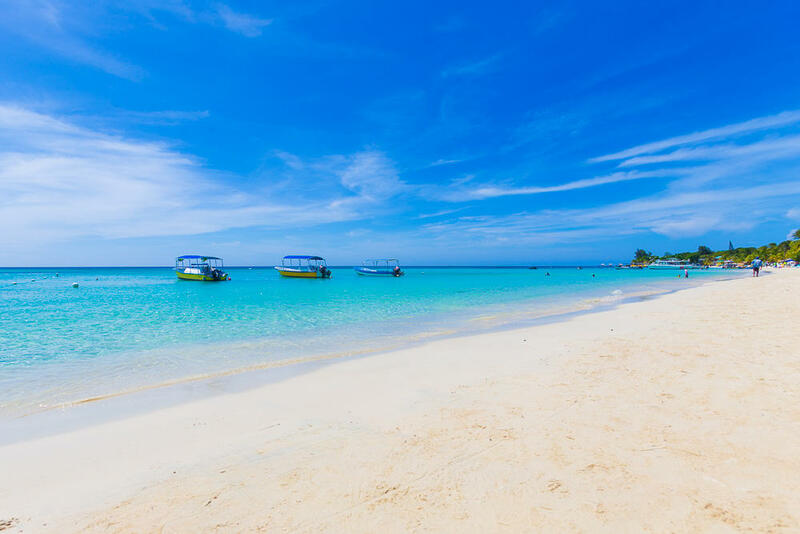 And, since you’re thinking about moving to Roatan, you should know that this island is a darling of International Living and Islands magazines. Seaside Inn sits slightly back from the hustle and bustle of the beach, offering a quiet, romantic, and intimate setting. Resting on 0.25 acres, you and your guests can enjoy beautifully landscaped grounds, including plenty of fruit trees. Mango, avocado, starfruit, lime, papaya, apple bananas, plantains, and pomegranate are all available! Guests love the convenience to a 5-Star PADI dive shop within just a minute’s walk. They also store guests’ gear while staying with us, offer a discount, and take out snorkelers if some guests are not divers. In just three years of operation, Seaside Inn has experienced rapid growth. Occupancy in high season is already at 92%. Seaside Inn enjoys a solid reputation; among constant new bookings, returning guests are also prominently represented. Seaside Inn offers a total 6 bedrooms, 6.5 baths, and 5 kitchens/kitchenettes that comprise the four guest accommodations. There are three beautifully appointed guest suites, each with private entrances, tiled en-suite private baths, and kitchenettes. There is al also a standalone bungalow with kitchen, dining area, living area, and private bath. Seaside Inn can accommodate 8-9 guests. Plans are also included for two more bungalows: one is wheelchair-accessible and the other is a 2-story, 2-bedroom unit with 2.5 baths. There is also a guest laundry, freezer stocked with cubed ice for drinks, and a huge DVD collection. 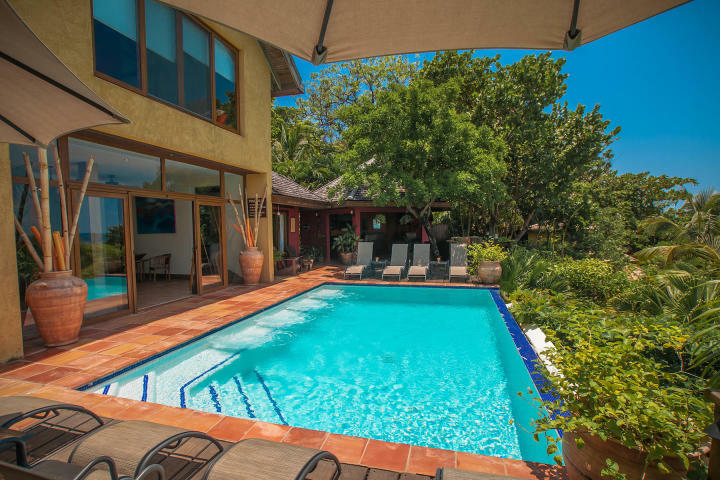 Guests are also offered Cable TV with over 100 channels and WiFi throughout the property. The accommodations also offer 8 new, energy-efficient split AC units. 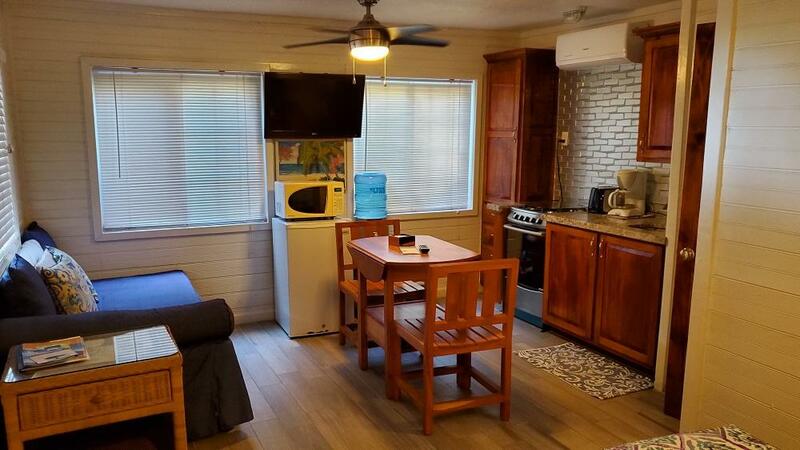 Each accommodation has the AC separately metered so that you can charge for AC usage and therefore avoid issues with abuse of the electricity consumption. The entire resort is backed up with a 22kwh propane generator with an automatic transfer switch. 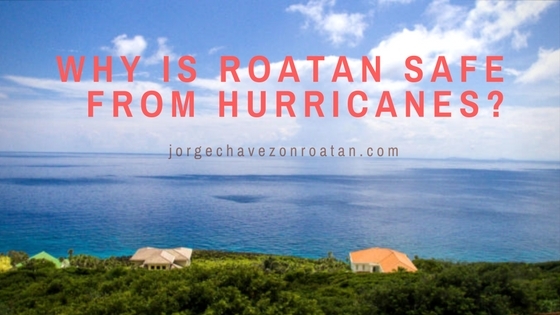 Even when (not if…Roatan is an island after all!) the power goes out, Seaside Inn can have electricity back on with 6 seconds! Even during the heat of summer, you and all your guests will always have air conditioning and water. The entire inventory of guest linens, dishes, furniture (indoor and out), and all guest accommodation décor is included in the sale price. 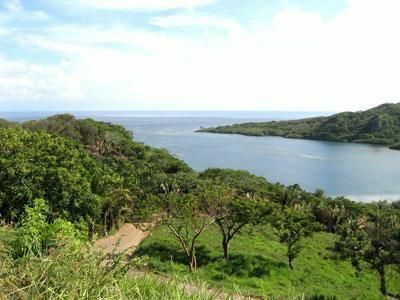 Purchasing a functional and successful Roatan B&B offers a new owner the opportunity to hit the ground running. There’s no need to set up all new vendor contracts or to furnish and decorate every square inch. You can jump right in and enjoy the hard work that was put into the business before you! Seaside Inn already has several contractors and vendors offering their services. A new owner can enjoy professional cleaning, laundry, and accounting services, as well as a website, booking sites, and a Facebook presence. The Inn already comes with the delivery of propane, vegetables, eggs, and water so a new owner can enjoy this smoothly running business. The main structure is solid concrete with a 2.5-foot-wide foundation, expertly built by prominent local builder Howard Bodden. Seaside Inn also has a well providing over 1,000 gallons a day. There is a 12,000-gallon cistern for the main building and a 7,000-gallon cistern for the standalone bungalow that catches rainwater. This can be used for bathing and washing dishes in the accommodations, but it is mainly used for keeping the landscaping watered in the dry months. If you’re already interested in this Roatan B&B for sale on West Bay Beach, then let’s get down to the logistics of real estate in Roatan. A new owner will enjoy an easy legal transaction with transferable corporations (holding and business). There are also no HOA fees to worry about at Seaside Inn. You’ll never have monthly fees or assessments. A new owner can choose to expand without being controlled by an HOA. Seaside Inn is already set-up with an electronic security system operated by Bulldog International (similar to ADT). The Inn is also ADA-compliant with a wheel chair ramp in preparation for an already-designed wheelchair-accessible bungalow. Seaside Inn is currently owned and operated by an honorably discharged disabled Marine Corp Veteran. Are you interested in learning more about Seaside Inn? Contact me for details and to schedule a visit. Of course the cost of living being low is all a matter of perspective. If you’re coming from a place with a fairly low cost of living already, then you might compare prices in Roatan and disagree with my assessment. 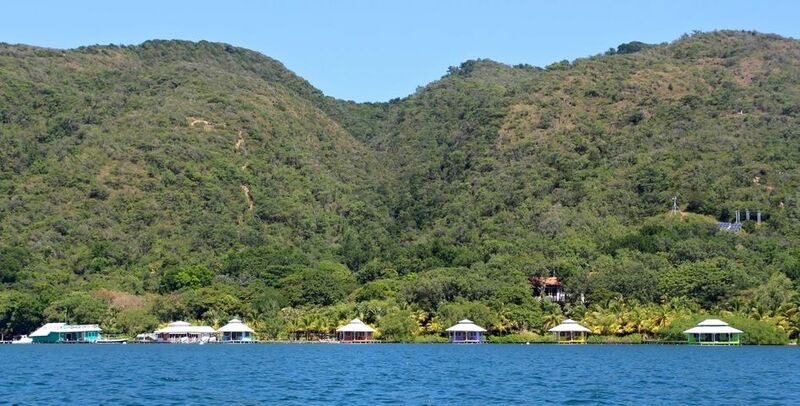 However, an unbiased look would be to compare Roatan with other Caribbean islands. 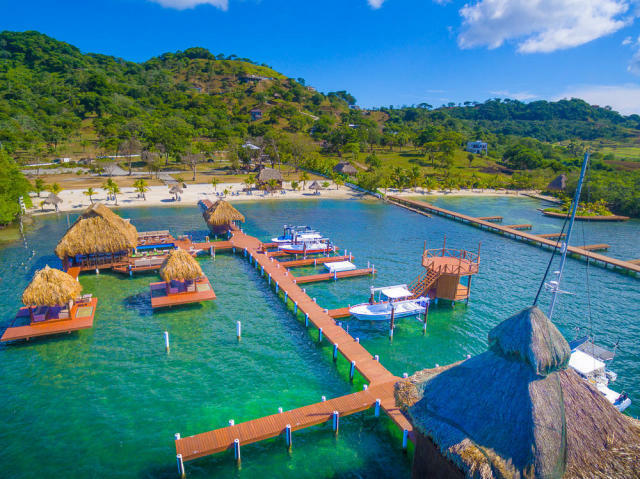 Regardless of your home region, comparing the island of Roatan with other island options in the region will show you costs on a similar basis. Islands require import costs and limitations on products and some services – that’s universal to islands by nature. But Roatan certainly offers a low cost of living for a tropical Caribbean island. 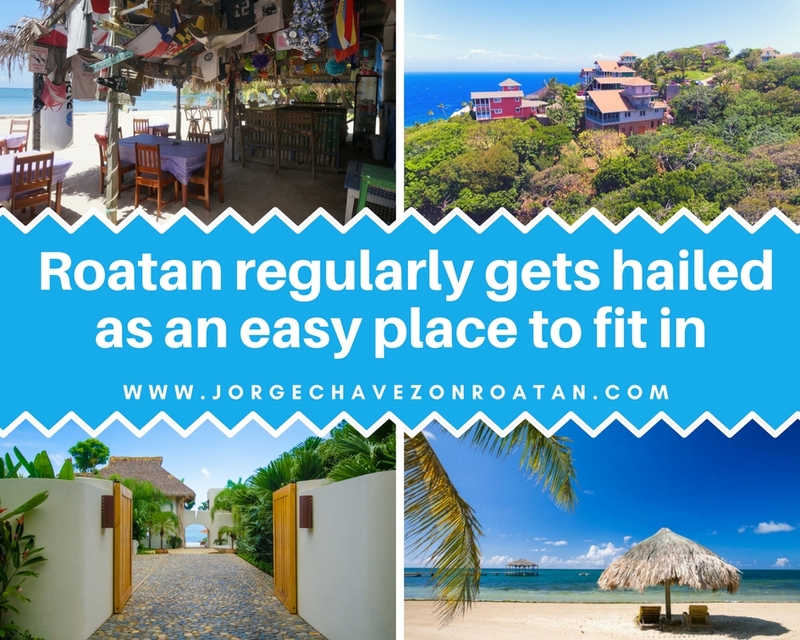 It’s for good reason that Roatan regularly gets hailed as an easy place to fit in. 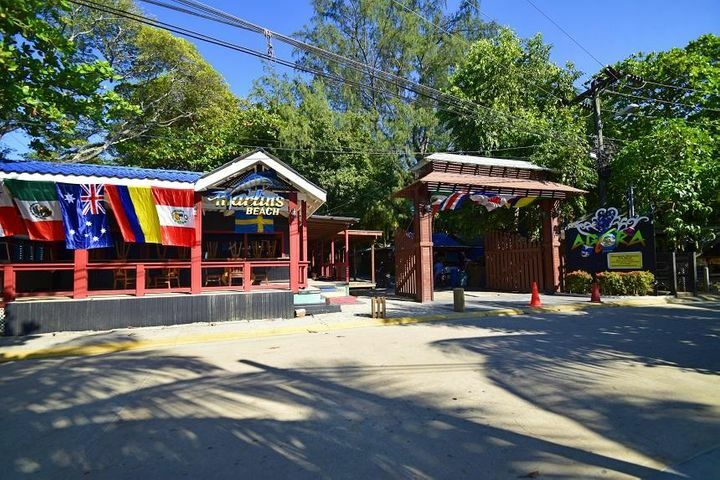 With an English-speaking local community and an extensive expat community, new arrivals find it very easy to make new friends and to create a community in Roatan. For most potential expats, a visit to Roatan is followed by several more visits before taking the big leap. Those visits offer you the chance to get to know people and to already start making friends. Facebook groups are also very popular for Roatan residents, offering a way for you to keep in touch with those new friends even while you’re back home making plans. You can stay in contact and continue to make more connections so that your eventual move to the island is a seamless transition. If you’re retiring to Roatan, you can easily acquire your residency. 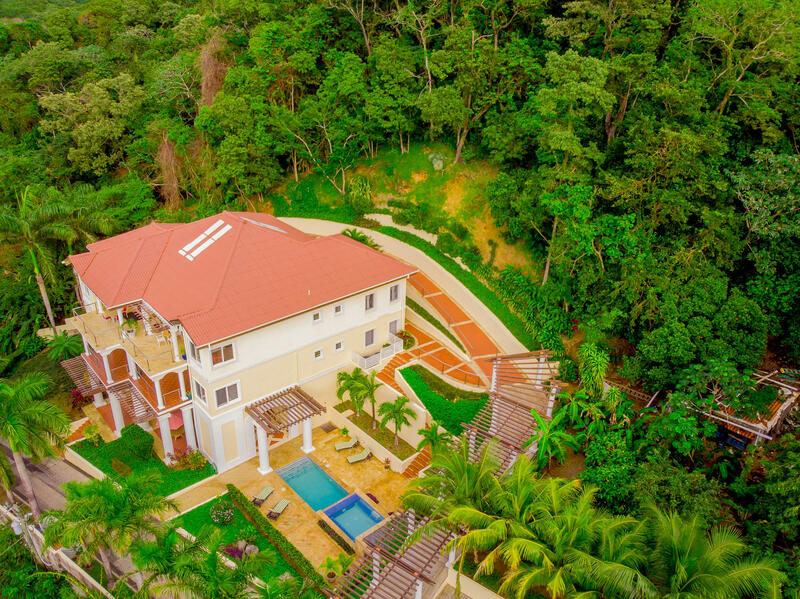 Retirees in Roatan simply need to prove their monthly income and then you can apply for residency and enjoy a few bonus perks, too! If you’re coming from the US or Canada, you can visit Roatan for up to 90 days without residency. This is a great opportunity to rent and get more familiar with neighborhoods and lifestyles before jumping into real estate. 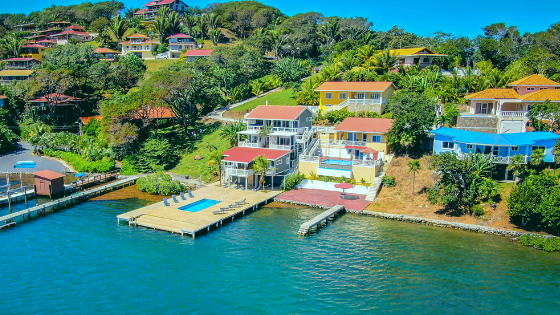 I am always happy to connect you with a reputable attorney in Roatan who can handle your residency application – it is usually best to work on your residency simultaneously with a real estate transaction if you’re new to the island. 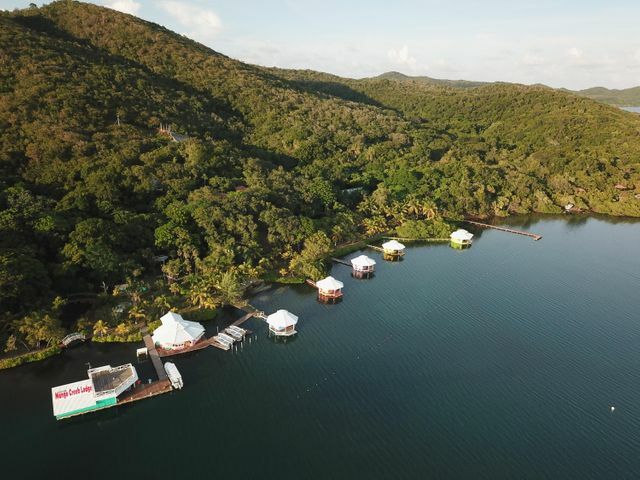 Retirement in Roatan can be even more affordable if you invest in real estate. While renting is a viable option for many, buying real estate offers you a rent-free lifestyle with an incredibly low cost of living. 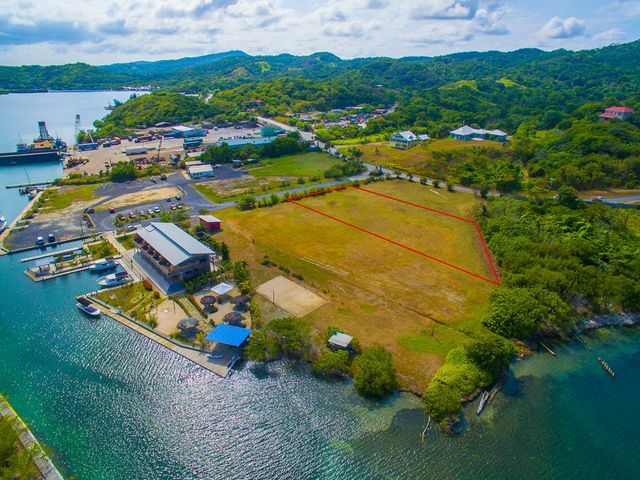 Many retirees in Roatan sell real estate back home and purchase a new retirement home in Roatan mortgage-free. That opens up so many doors for your daily cost of living. Imagine all the fun activities you could do with that extra cash!! Don’t you agree that retirement in Roatan is a dream come true? 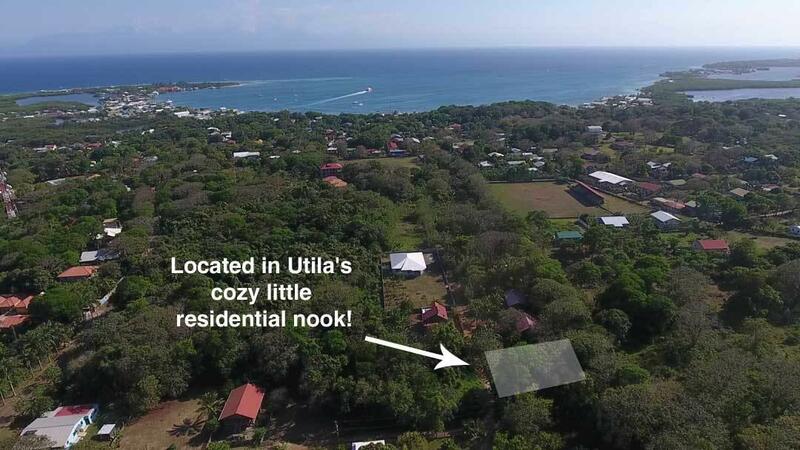 You can actually have it all here: Beautiful beaches, tropical climate, affordable real estate, low cost of living, and a wonderful community of friends and neighbors. If you are considering retiring overseas, I strongly recommend you consider Roatan. While I obviously have a biased opinion, you can also listen to the experts who gauge retirement destinations around the world! Roatan offers retirees an excellent quality of life. 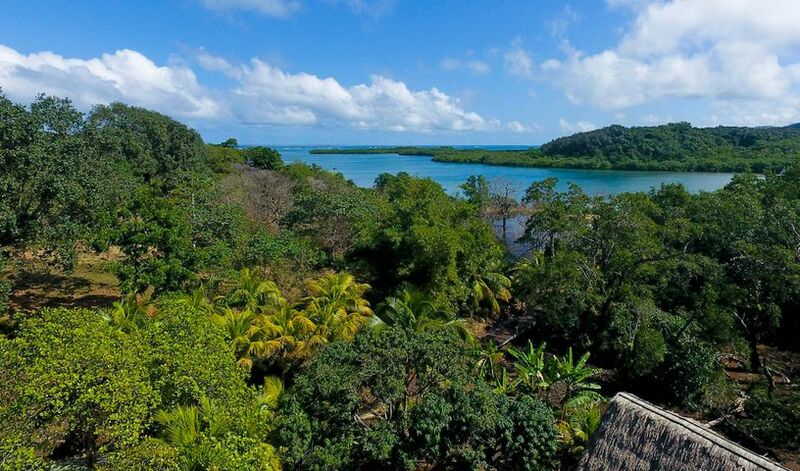 You’ll love spending your time outdoors and breathing fresh tropical air. You’ll enjoy a slower pace of life and a focus on daily wonders, admiring vibrant tropical flowers and swimming in the turquoise seas. No place is ever perfect and there are compromises to be made regardless of where you choose to live. 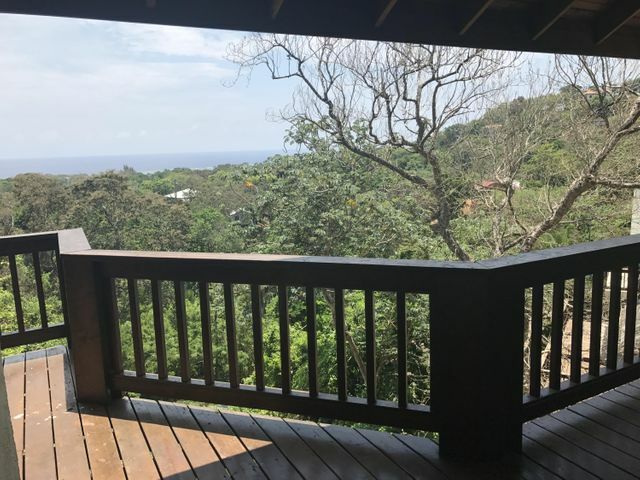 But I can personally attest to life in Roatan being my dream come true…I moved my family here for a better quality of life and we have never looked back! 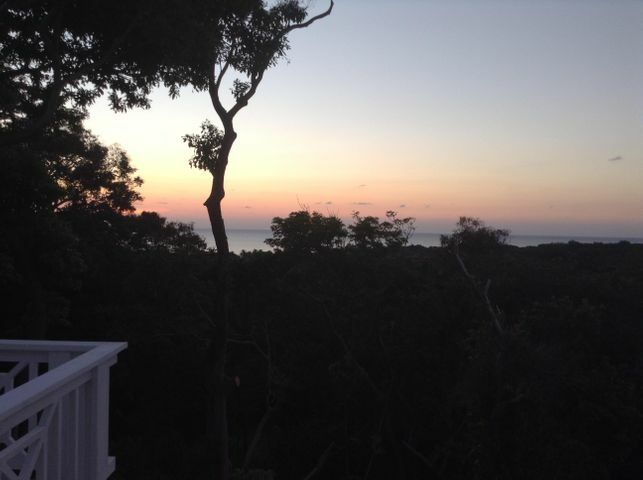 Are you thinking about retiring to Roatan? Feel free to reach out with questions any time, I’m always happy to help! We heard about all that crazy winter weather you’re having up north. Bomb-cyclone storms and snowfall in Tallahassee…the world has gone crazy! Of course, we don’t notice much of that nonsense while sitting here on the beach in the sun. We spend our winters much like we spend our summers: under the palm trees, toes in the sand, sunglasses on. We pour a cold drink and enjoy the sunset. We go snorkeling and scuba diving and deep sea fishing. In short, “winter” is just a word to us…a reminder for us expats that we never have to worry about shovelling snow or wearing so many layers that our arms stick straight out like a starfish. We prefer our starfish gracing the sand by the coral reef. “Winter” is a term for another place and time – not for those of us living in the tropics. Here, we get to enjoy the great outdoors all year long! We can sunbathe and bathe in the sea any day we choose, without hiding away in hibernation for half the year. We don’t waste that kind of time here in Roatan. We don’t scurry from the front door to the car door across icy pavement; we tap dance across the warm sand until our feet land happily in the calm surf. We don’t scrape our windshields with frozen fingers; we roll the windows down and let that fresh salty air fill the car. Here in Roatan, “winter” is just a word. We have rainy season, sure. But that rainy season is most welcome because it keeps our island green and pretty. We welcome the rain for our fruit trees and palm trees, for our hibiscus and our orchids growing everywhere. Yes, even during the “winter” our island is alive and fresh and filled with color. There simply are no grey, dreary days here in the tropics. Even when the rain comes down in sheets, the island is alive with growth and color. We don’t experience the silence of cold winter months when animals hide away and empty brittle branches eerily blow in the wind. Winter in Roatan is filled with sound and life. Birds sing all day long and geckos call to each other by the outdoor patio lights; raindrops tap palm fronds and glide down those graceful green fingers. We don’t do “winter” in Roatan…not the way you know it. We do winter our own way, filled with natural beauty and the sweet relief of knowing the only white stuff on the ground is soft powdery sand. If you love northern winters, this island is not for you. But if you find yourself cursing and hating the cold winter months every year…well, you might just find Roatan to be your paradise. Come escape the cold and join those of us who choose this tropical island lifestyle. We don’t do “winter” here in Roatan. See for yourself how easy life can be without those winter blues!